If you intend on framing your canvas, select the .75" stretcher bar option. If not specified, gallery wraps will have black sides but you have to option of selecting a color of your choice. The mirror wrap option "copies and pastes" the sides of your image, "flips" them and then adds to the image to simulate a continuation of the image. Image overlap wrap option will crop into the image on sides. Please be sure to specify and allow for this when sizing your image. Timeless protective varnish is included at no additional cost. 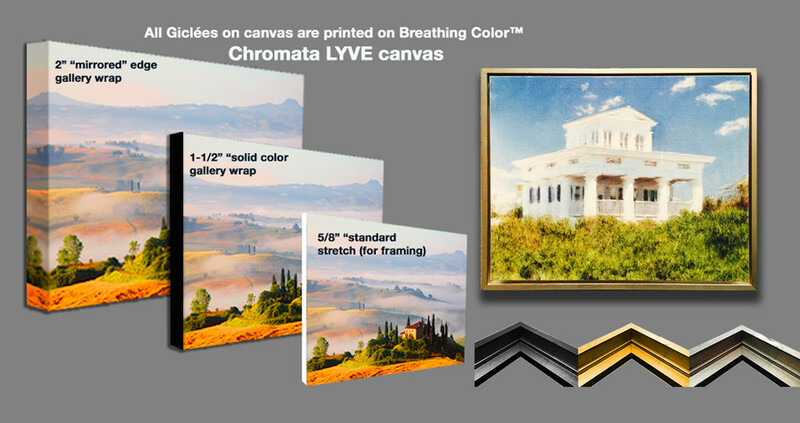 Your stretched canvas will "sit atop" the lower edge of the frame. A 1/4" of space surrounds and separates the image from the frame simulating a "floating effect". Outer depth is 2". Sides are the same finish as inside. Our typical turnaround for "print only" orders is 3-4 days. Stretched canvas usually takes 4-5 days. Special projects, processes, etc. may add additional time. Seasonal and/or large orders may also impact our turnaround. You may always contact us to discuss your needs and deadlines. We will always do our best to accomodate the needs of our clients. 48 hr. RUSH SERVICE for prints may be requested for an additional charge. Check box under "OPTIONS" PLEASE CALL US TO PRE-SCHEDULE!